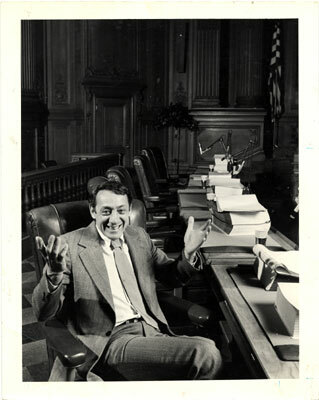 In 1977, San Francisco politics was taken by storm when gay rights activist Harvey Milk was elected to the Board of Supervisors. As the first openly gay man elected to public office in the United States, Milk’s election was a triumph over anti-gay stereotypes. Milk’s ability to mobilize gays and straights alike resulted in the defeat of a statewide proposition to severely limit gays’ employment rights. Though Milk was assassinated 11 months after he was elected to office, his legacy of fighting for gay rights has inspired a new generation of civic activists across the United States, fighting for sexual equality and the expansion of civil liberties for gays and lesbians. In the mid-twentieth century, homosexuals were legally and socially discriminated against in the United States. However, in 1969 during a police raid on a gay bar in New York City, instead of running from the authorities, gays chose to protest their right to visit gay bars. The riots that followed the raid, which became known as the Stonewall Riots, led to the public exposure of police brutality, sparking the first gay rights organization in the U.S., the Gay Liberation Front, which took on a decidedly anti-war, pro-civil rights, anti-establishment identity. It was during this time that America’s gays moved to the west coast en masse, and in particular, to San Francisco. Harvey Milk was an early migrant to San Francisco’s tolerant Castro District, where he moved to live openly with his partner. However, even in this “tolerant” area, the gay community faced discrimination from local businesses, as both consumers and employees. Milk became involved in local politics and ran for public office to encourage equality and enhance the lives of working-class San Franciscans and minorities. After losing his first three campaigns, Milk was elected Supervisor of the city of San Francisco in 1977, and as the first openly gay man elected to public office in the United States, Harvey Milk had already reached a milestone in the fight for gay rights. However, for Milk, winning the election, while monumental, was just the first step in his plan to promote gay rights and equality. Milk sought not only to change the stereotypes that existed about gays, but to also promote a legal framework that supports gays, including the passage of a gay rights bill, and speaking out against a barrage of legislation which would restrict gays’ civil and political liberties. Throughout the 1950s and ‘60s, the FBI and local police departments kept files on known gay activists, while the U.S. Postal Service kept track of addresses that received materials pertaining to homosexuality. State and local governments passed laws that shut down bars catering to homosexuals and performed “sweeps” to rid neighborhoods and local hangouts of gay men and women. Following the Stonewall Riots of 1969, the United States was swept up in a public debate about gay rights. Even though Jimmy Carter had become president in 1976 on a platform that supported human rights, and many states had in place laws that protected gays and lesbians from discrimination, a conservative opposition began to reinforce anti-gay stereotypes. By 1977, an initiative led by celebrity Anita Bryant to repeal a law in Dade County, Florida, prohibiting discrimination on the basis of sexual orientation, passed with an overwhelming majority. The gay rights movement faced similar blows in cities in Minnesota, Kansas and Oregon. The only way to end the discrimination against gays in America, for Harvey Milk, was to break the mold and enter local politics. Thus, the gay rights movement launched a grassroots effort to elect Milk to San Francisco’s Board of Supervisors; while his first attempts were unsuccessful, Milk gradually began growing a base of support. Reporter John Cloud explained, “Milk had a powerful idea: he would reach downward, not upward, for support. He convinced the growing gay masses of ‘Sodom by the Sea’ that they could have a role in city leadership, and they turned out to form ‘human billboards’ for him along major thoroughfares. In doing so, they outed themselves in a way once unthinkable. It was invigorating.” Milk reached out to anyone in his district who would listen by canvassing neighborhoods, turning his camera store into an official voter registration post while leading multiple rallies for gay rights. In November 1978, after Milk took office, he was confronted with a piece of anti-gay legislation known as the Briggs Initiative, or Proposition 6, which would bar gays from teaching in schools. Because the initiative covered the whole state of California, Milk understood that the only way to convince Californians that gays should not be fired simply because of their sexual orientation was for closeted gays to come out. Milk urged gays all over the United States to come out of the closet, even declaring, “If a bullet should enter my brain, let that bullet destroy every closet door.”Proposition 6 was defeated by over one million votes on November 7, 1978, with the support of both Ronald Reagan and President Jimmy Carter, heralding a new tolerance for gays nationwide. Milk was also a strong believer in nonviolence, which played heavily into his messaging strategy. As his nephew Stuart Milk said, his “commitment to nonviolence was at his very core.” Milk would use his soap-box and bullhorn, rallying the gay community with the slogan “My name is Harvey Milk and I’m here to recruit you” to march in thousands through the city of San Francisco, but he never let his supporters get out of control. Once elected, Milk left the task of street organization to his grassroots team, who would lead marches to City Hall, where Milk would emerge to calm down the crowd. While protest rallies and grassroots movements were key tactics in Milk’s campaign, at the core of his strategy was improving the lives of his constituents, even if that meant solving the basic problems of urban dwellers. For example, Milk openly acknowledged that “whoever can solve the dogshit problem [in the city] can be elected mayor of San Francisco, even president of the United States.” Milk followed his own advice, sponsoring a bill which made dog owners pick up after their pets, and organized a press conference in which he purposely stepped in dog waste to make a point. This simple publicity stunt came to define Milk’s career as a politician, not only because he knew how to garner media attention for his cause, but because it represented his desire to solve everyday San Franciscans’ problems. Unfortunately, Harvey Milk’s political career came to a tragic end on November 27, 1978, when he and San Francisco mayor George Moscone were assassinated by Dan White, a disgruntled ex-city supervisor who had demanded his job back after resigning weeks earlier. Despite Milk’s passing, his progressive coalition in San Franciscan politics created a legacy of gay tolerance in San Francisco and a model for gay rights advocacy nationwide. The work he did to promote tolerance and equality earned him a posthumous Presidential Medal of Freedom in 2009, led Time magazine to name him as one of the most influential people of the 20th century, and led the state of California to name a holiday after him on his birthday, May 22. In 2008, Milk, a Hollywood film of Milk’s life, was released, bringing Milk’s voice to the present-day gay movement in the United States. The film was nominated for eight Oscars, winning two for Best Actor and Best Original Screenplay. In his Oscar acceptance speech, screenwriter Dustin Lance Black recounted his own experience with Milk’s story: “I heard the story of Harvey Milk, and it gave me hope. It gave me the hope to live my life. It gave me the hope that one day I could live my life openly as who I am…” Despite his tragic death in 1978, Harvey Milk’s legacy lives on through the Harvey Milk Civil Rights Academy, an alternative school in the Castro district of San Francisco with a strong emphasis on teaching nonviolence and tolerance. Cloud, John. “The Gay March: A New Generation of Protesters.” Time Magazine. October 12, 2009. Cloud, John. “The Pioneer Harvey Milk.” Time Magazine. June 14, 1999. Cohen, Bennett. “The Whole Milk.” San Francisco Magazine. November, 2008. Cohen, Bennett and Heather Smith. “The Harvey Milk Effect.” San Francisco Magazine. November, 2008. Fejes, Fred. “The Briggs Initiative Goes National.” The Gay and Lesbian Review Worldwide. July/August, 2008. Gilleran, Luke. “Who Was Harvey Milk and Why Is He Important? The Times of Harvey Milk.” Triangle Community Center. Gilleran, Luke. “Who Was Harvey Milk and Why Is He Important? Power to the People!” Triangle Community Center. Harvey Milk Civil Rights Academy Official Website. Hope, Randy. “Remembering Harvey Milk.” Gay and Lesbian Times. May 21, 2009. Ledbetter, Les. “Bill on Homosexual Rights Advances in San Francisco.” New York Times. March 22, 1978. Martin, Michael. “The Resurrection of Harvey Milk.” The Advocate. November, 2008. Nolte, Carl. “City Hall: Slayings 25 Years Later.” San Francisco Chronicle. November 26, 2003. Obstacles to Equality: Government Responses to the Gay Rights Movement in the United States. Pierceson, Jason. “The Rise and Stagnation of Gay Rights in American Political Development.” Midwest Political Science Association Annual Conference. April 12-15, 2007. Signorile, Michelangelo. “A Journey Through Our Gay Century.” The Advocate. January 18, 2000. Romero, Francis. “The Presidential Medal of Freedom.” Time Magazine. August 12, 2009. Ulaby, Neda. “'Gotta Give 'Em Hope': The Legacy Of Harvey Milk.” NPR. November 11, 2008. “Nation: Another Day of Death.” Time Magazine. December 11, 1978. “Time 100 Persons of the Century.” Time Magazine. June 14, 1999. Arethra, David. No Compromise: The Story of Harvey Milk. Greensboro, NC: Morgan Reynolds Publishing, 2009. Clendinen, Dudley and Adam Nagourney. Out for Good: The Struggle to Build a Gay Rights Movement in America. New York, NY: Touchstone, 1999. Shilts, Randy. The Mayor of Castro Street: The Life and Times of Harvey Milk. New York, NY: St. Martin’s Press, 1982. Epstein, Rob. “The Times of Harvey Milk.” Hulu, 1984. Van Sant, Gus. “Milk.” Focus Features, 2008. “Dustin Lance Black 2009 Best Screenplay Oscar Acceptance Speech - Milk.” Youtube. Dudley Clendinen and Adam Nagourney. Out for Good: The Struggle to Build a Gay Rights Movement in America. New York, NY: Touchstone, 1999. 22-24. Shilts, Randy. The Mayor of Castro Street: The Life and Times of Harvey Milk. New York, NY: St. Martin’s Press, 1982. 362. Francis Romero. “The Presidential Medal of Freedom.” Time Magazine. August 12, 2009; “Time 100 Persons of the Century.” Time Magazine. June 14, 1999; Harvey Milk Civil Rights Academy Official Website; Hope.